[Updated April 29, 2016] A key lawmaker is pressing the Department of Defense (DoD) about its lack of support for a plan it helped devised to protect the US from the consequences of losing GPS service. In an April 13 letter Congressman John Garamendi, D-Calif., sharply questioned assertions made by defense officials at a hearing four weeks earlier that establishing of an eLoran system in the United States as a backup for GPS was not the best course of action and that eLoran was not a program for which the Defense Department had a requirement or in which it had a major role to play. Garemendi’s letter presents data — on eLoran’s role, the availability of eLoran and L2C-capable GPS user equipment, and other issues — that he describes as “inconsistent” with their answers at the hearing. DoD Deputy Secretary Robert Work co-chairs the National Executive Committee (ExCom) for Space-Based Positioning, Navigation, and Timing (PNT), which sent a letter to Garamendi December 8 in support of eLoran. The ExCom had "reviewed several potential solutions," it wrote, "and assessed that an enhanced Loran (eLoran) network would be a viable nationwide complementary capability for GPS applications in US critical infrastructure." Moreover the body agreed to a twofold strategy in which it would "pursue potential near-term opportunities to leverage public and private sector capabilities and resources to support a timing focused eLoran network, while also documenting the requirements for a more comprehensive complementary PNT capability for the nation’s critical infrastructure." A year ago Garamendi introduced the National Positioning, Navigation, and Timing (PNT) Resilience and Security Act of 2015 (H.R. 1678), which would require the Secretary of Defense to establish and sustain a reliable, land-based positioning and navigation system to complement and backup GPS for military and civilian uses. That backup, based on the bill’s language, would most likely be eLoran. The Department of Defense, however, does not appear to have warmed to the idea. Pressing his case during the March 15 hearing before the Strategic Forces Subcommittee of the House Armed Services Committee, Garamendi questioned Gen. John Hyten, the commander of Air Force Space Command, and Deputy Assistant Secretary of Defense for Space Policy Douglas Loverro as to why the department was not acting to support of the ExCom position. Garamendi also questioned why DoD did not see a role for itself in supporting eLoran or a need for eLoran for its own use given that other countries had adopted the technology. Garamendi: Gen. Heyten, is the Air Force in the military dependent on GPS for nearly everything? Garamendi: Like the ATM [automated teller machine] won’t work without the timing [from GPS]? Hyten: Your ATM won’t work. . . . Stoplights stop working. Garamendi: It’s been said that GPS is the single point of failure . . . is that correct, for virtually everything that you talked about here? Hyten: It could be looked at as a single point of failure, but one of the things we do is we build resiliency into our weapon systems. We have a backup inertial navigation system that we use in most of our weapon systems that allows us to do this. Nonetheless, GPS is a vulnerability; so, we’re looking at a number of different ways we can talk about in the closed hearing in more detail, but a number of different ways to ensure that we can continue to operate in a GPS-denied environment. Garamendi: Have you considered terrestrial-based timing? Hyten: There are a number of terrestrial-based timing sources that are out there. eLoran is one of the ones that we’re looking at across the coast. That’s not a DoD system, but the Department of transportation and the Coast Guard in particular are looking at that. That has significant benefits around our ports to reduce vulnerability of GPS. But in order for eLoran to work there have to be eLoran receivers that can take the signals off of eLoran because if you build eLoran and there’re no receivers it would be like building GPS without GPS receivers. Garamendi: Are the receivers possible to be built? Hyten: Yes, they are. Again, somebody has to invest that money. The GPS market blossomed because there were huge commercial market. The question you have to ask yourself for eLoran — and that’s for somebody that’s not on this panel. That’s a Department of Transportation question – But what is the marketplace that will come for eLoran? It’s probably shipping, those kind of people. Garamendi: Let’s see, the Department of Defense is for defense? Hyten: The Department of Defense is for defense, absolutely. Garamendi: But if somebody wanted to knock out our electrical systems or our communication systems or our financial systems they would knock out the GPS wouldn’t they? Hyten: They would . . .
Garamendi: Is that is a defense issue? Hyten: That is a defense issue. That’s why we look at that. That’s why we are part of the national Position Navigation and Timing ExCom. Garamendi to Loverro: Why did you write me a letter saying that there’s no role for the Department of Defense for the eLoran system? Why is the Department of Defense not willing to spend like, I don’t know, $50 million dollars a year to provide the foundational backup system to GPS? Why did you write that letter to me? Loverro: I’m sorry sir was that to me? I didn’t hear who it was addressed to. Garamendi: Well your name was on it. Loverro: I just didn’t hear if you said that was addressed to me. Sir, so we do not have a Department of Defense requirement for GPS. You do know. . . .
Garamendi: But we just established the fact that GPS, that the absence of GPS, is a defense issue. Loverro: Yes sir. There are many issues that go ahead and transition from defense issues to national security issues. I would go ahead and state. . .
Garamendi: Ah, the Department of Defense is not a national security issue? Garamendi: Is that what you are saying to me? Loverro: I absolutely agree it is. As you know I have told you that I wanted to look into this question more. I’ve done that. I still owe you a written paper on this, I understand. My sense is that eLoran is one of several capabilities that could help this issue but I think the. . . .
Garamendi: And the other ones are. . . ? Loverro: The other ones are better — better GPS or GNSS user equipment, local time sources. In fact, in many cases it’s a combination of all three. Both Loverro and Hyten told Garamendi that no eLoran receivers were available in the market, a problem they said they had seen before. He said the same situation has arisen with L2-capable civil receivers. "You may not know," Loverro Garamendi, "that when we created the newest version of GPS we created a second civil signal called L2 based upon the President’s direction back in 1996, because many people believed the commercial world would adopt it. 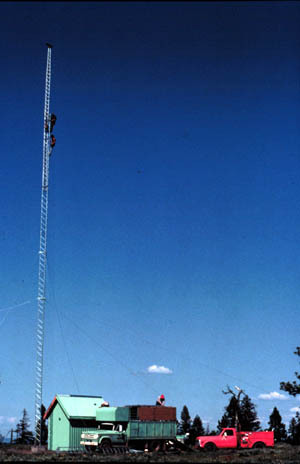 There are no L2 receivers available in the world today because nobody feels it necessary to listen to the second civil signal. So, I think that our concern isn’t so much what is the source of timing, which eLoran would be a good and appropriate source for the continental United States. I think the question is: How do we make sure that people adopt the receiver infrastructure?" Loverro’s comments seem to refer to the more recent civil signal known as L2C now being implemented on GPS satellites rather than the legacy L2 that only transmits a military signal, which has been available on GPS satellites from the beginning of the GPS program. The Air Force has since confirmed to Inside GNSS that Loverro, indeed, was referring to L2C. The assertions regarding the availability of L2C and eLoran receivers "appear to conflict with other publically available information that has been given to me," Garamendi said in his April letter, which addressed the March 15 testimony point by point. In fact, commercial receivers are indeed on the market that use the legacy L2 signal, although those civilian devices cannot process the encrypted P/Y-code transmitted on the signal to prevent military users from being spoofed. That has not stopped manufacturers from finding a way to enhance receiver performance with codeless and semi-codeless techniques, however. In fact, the U.S. government committed to support codeless users in 2015, saying it would maintain the signal characteristics of the existing GPS L2C, and L2 P(Y) signals, as well the GPS L1 C/A and L1 P(Y) signals, to enable codeless and semi-codeless GPS access. This will not change until two years after the new L5 signal has begun broadcasting on 24 operational satellites. Satellites with L2C capability began launching in 2005, and the Air Force began broadcasting a civil navigation (CNAV) messages on L2C in December 2014. Garamendi pointed out that the signal was still considered preoperational as of March 2016, according to the official GPS website gps.gov. Even so, numerous commercial receivers are able to exploit the L2C signal. For example, Trimble has had a receiver with L2C capability since 2007 and now provides the signal on its OEM product, BD935-INS. NovAtel offers L2C on the company’s OEMV-2 and OEMV-3 receivers. eLoran receivers are also "available today," Garamendi wrote in his April 13 letter to Hyten and Loverro, and "the apparent lack of receivers is directly related to the U.S. government terminating Loran-C signals and its lack of commitment to eLoran." Moreover, he pointed out, the National Institute of Standards Technology is working to fit an eLoran receiver on a microchip — which could greatly reduce the cost and enable eLoran to be incorporated into mobile devices. And Garamendi’s letter mentioned a DoD sources-sought request sent out last year for companies that could provide up to 50,000 eLoran receivers. The commercial eLoran receivers now available primarily support timing applications. UK-based Chronos Technology launched the CTL8200 eLoran GPS UTC Timing Receiver in 2014. UrsaNav offers four different receivers, three of which can also process signals from Chayka — a Russian system similar to the old Loran-C network in the United States. The infrastructure foundation for eLoran rests on the sites used by Loran-C. In fact, eLoran is shorthand for Enhanced Loran. Experts told Inside GNSS a year ago that Russia was upgrading Chayka to enable eLoran-like operations. Hyten and Loverro told lawmakers that other nations had abandoned eLoran; a point Garamendi said was inconsistent with his information. The Congressman cited a National Geospatial Intelligence Agency document from 2014 that said South Korea and Saudi Arabia — as well as Russia, China and the United Kingdom — had such networks. The UK did turnoff its network at the end of the 2015 — a move they, along with Norway and Denmark, are now reconsidering. Garamendi’s office did not reply by press time to a question asking if the lawmaker had received a response to his letter.